Glencoe, named for a Scottish battle, in central Alamance County is the site of Glencoe Mill and Village, one of the best preserved mill communities in the state. Built between 1879 and 1880 by William and James Holt, sons of textile magnate Edwin M. Holt, the 95-acre complex was home to one of many prosperous textile mills in North Carolina. Glencoe Mill produced flannel, plaid, and other cotton cloth for almost 80 years. When the mill ceased production in 1954, the workers abandoned their company-owned homes in search of work. The village sat virtually untouched for nearly three decades, a stark reminder of a once vibrant textile industry. The site was listed on the National Register of Historic Places in 1979. In 1997 Preservation North Carolina (PNC), an organization dedicated to preserving the state's historic structures, bought the 105-acre property, which had 32 remaining houses (some in very poor condition) and several mill buildings. PNC installed water and sewer lines, upgraded the roads within the property, and began selling the houses to buyers interested in restoring them and living in Glencoe. Several new houses also have been built in the style of the historic houses, and the mill buildings are undergoing renovation. Julian Hughes, Development of the Textile Industry in Alamance County: Evolution of Warp and Weft in Alamance (1965). Preservation North Carolina, "A New Start for Glencoe Mill and Mill Village," North Carolina Preservation 2 (1997). "Glencoe Mill Village." Preservation North Carolina. http://www.presnc.org/Property/Glencoe-Mill-Village (accessed October 30, 2012). "Textile Heritage Museum at Glencoe, North Carolina." Textile Heritage Museum. http://www.textileheritagemuseum.org/ (accessed October 30, 2012). Matchar, Emily. "Return to a Mill: N.C.'s Glencoe Village, Now and Then." Preservation: The Magazine National Trust for Historic Preservation. Feb. 22, 2010. http://www.preservationnation.org/magazine/2010/march-april/return-to-a-mill.html (accessed October 30, 2012). Oral History Interview with Ethel Marshall Faucette, November 16, 1978, and January 4, 1979. Interview H-0020. Southern Oral History Program Collection (#4007). http://docsouth.unc.edu/sohp/H-0020/menu.html (accessed October 30, 2012). 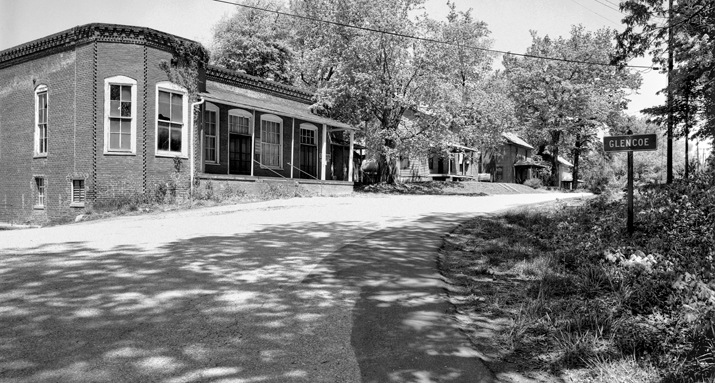 The company store (left) and houses along a street in Glencoe, 1978. Courtesy of North Carolina Office of Archives and History, Raleigh.